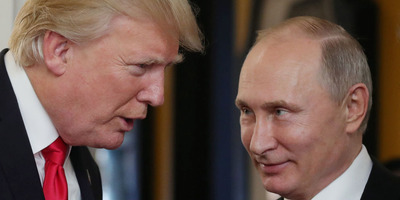 MIKHAIL KLIMENTYEV/AFP/Getty ImagesDonald Trump and Vladimir Putin. The Trump administration took its boldest stance against Russia yet on Thursday by imposing new sanctions on Russian nationals and entities. The sanctions will help the US show solidarity with its Western allies amid a nerve agent attack on a former spy on British soil believed to have been carried out by Russia. But whether the sanctions will have a material impact on Russia’s cyber operations or its economy remains to be seen. The Trump administration’s announcement Thursday of new sanctions against 19 Russian nationals and five Russian entities marks the US’s boldest response to Russia’s election interference since President Donald Trump took office. The US intelligence community concluded in January 2017 that Russia mounted an elaborate campaign to interfere in the 2016 US election with the goal of elevating Trump to the presidency. It did not make a judgment on whether it succeeded in altering the outcome of the race. Thursday’s sanctions target Russians indicted last month as part of the special counsel Robert Mueller’s investigation into Russia’s election meddling on charges of conspiracy to interfere in the election by waging a social-media influence operation to sow discord and sway public opinion in the US in favour of Trump. Though the Trump White House has acknowledged that Russia meddled – while maintaining that it was not to help Trump and did not have an effect on the election’s outcome – it has so far fallen short of making a specific statement or calling out Russia for its aggression. The new sanctions also come more than a month after a congressionally mandated deadline by which the White House was supposed to penalise Russia for its interference. While most experts agree that the sanctions are welcome, their effectiveness is up for debate. Thursday’s announcement “is a welcome, if long overdue, step from the Trump administration,” said Ned Price, a former senior director at the National Security Council who previously worked for the CIA. He added that he was “relieved” the administration was complying with its legal obligation to the sanctions bill that Congress passed last year. Trump signed the bill into law in August but called it “seriously flawed.” When the law’s deadline to impose the sanctions came in January, the administration declined to do so, saying that just the law’s existence was deterring Russian defence sales. David Kennedy, the CEO of TrustedSec who previously specialised in cyber warfare at the National Security Agency, said the sanctions seemed to stem from the Russia investigation, as they target the Internet Research Agency, one of the entities indicted in February. “It doesn’t do much as far as swinging the pendulum one way or the other, but what it does is directly call out Russia for meddling in the election cycle, which is a pretty bold statement from the US that hasn’t been made in the past,” he said. The administration’s response also comes as it weathers additional criticism for what some have characterised as a lukewarm response to the nerve agent attack on the former spy Sergei Skripal in the UK. The British government concluded earlier this week that it was “highly likely” the attack was ordered by the Russian government and, in retaliation, it expelled 23 Russian diplomats and imposed additional penalties on some Russian nationals living in the UK. The White House initially called the attack reckless and indiscriminate but declined to name Russia as the perpetrator. After facing sharp scrutiny from observers and former diplomats who said the US was hanging its closest ally “out to dry,” the White House and multiple US officials said Russia was responsible and that the US stood with the UK in condemning Moscow. Experts say the US’s latest move is significant because it joins the country with its Western allies in pressuring an increasingly aggressive Russia, whose cyber and military influence has become more overt in recent years. Whether the sanctions will have a material impact on Russia’s operations, particularly as it relates to the cyber arena, remains to be seen. “Such narrowly targeted sanctions have little to no impact on the operations of Russia’s intelligence services or its proxies, since these organisations don’t transact (at least overtly) through the US financial system,” Carpenter wrote. “We can’t just go out and say we’re going to hack Russia and completely cripple their infrastructure, because that’s not what we do as a country,” he said. The US could retaliate against Russia in the form of a military offensive, shutting down specific portions of its cyber capabilities or stealing and publishing hacking tools used by Russian intelligence – much like the Russia-linked group the Shadow Brokers did with US cyberweapons in 2016. But even that, experts say, is a double-edged sword for the US because it would risk burning crucial intelligence sources. Carpenter said he wasn’t optimistic. “I suspect the Trump administration will cite these designations as evidence that it is getting ‘tough’ on Russia, but in this case it’s all smoke and mirrors,” he wrote.